To remove the stigma from the term “writing assessment” for classroom teachers, I argue that we should recognize the classroom as the primary site of writing assessment, making visible the ways students and teachers can and do actively negotiate writing assessment discourses, histories, values, and their own biases in this hyperlocal space. As such, this article offers a rich case study of these negotiations in my own first-year writing classroom, demonstrating the affordances and constraints of using digital badging to make visible, with visual modes, those discussions and decisions about what counts as “good” writing and who gets to decide. Borrowing from research in participatory literacies as well as social semiotics, I argue that social justice in classroom writing assessment is attainable only when students and teachers participate in assessment design, interpretation, and continuous inquiry into pre- and post-assessment conditions. In adopting digital badging platforms, I have found the technological means to engage students in this participatory process. This article demonstrates how we can, in our classrooms, pair this open-source technology with practices of critical validity inquiry (Perry) to consciously interrupt bias, promote a more diverse construct of writing, and better meet the needs of students of color and lower income students. West-Puckett, Stephanie. 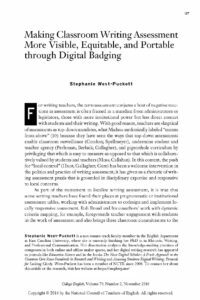 “Making Classroom Writing Assessment More Visible, Equitable, and Portable through Digital Badging.” College English 79:2 (2016) 127-151. Copyright ©2016 by the National Council of Teachers of English. Reprinted with permission.